Parts of a butterfly :. Excellent info Green Baron....where did you get this from? "My, my, what BIG wings you have! ", said Little Red Riding Hood to Great Mormon. "The better to fly away with you, my dear", replied Great Mormon. 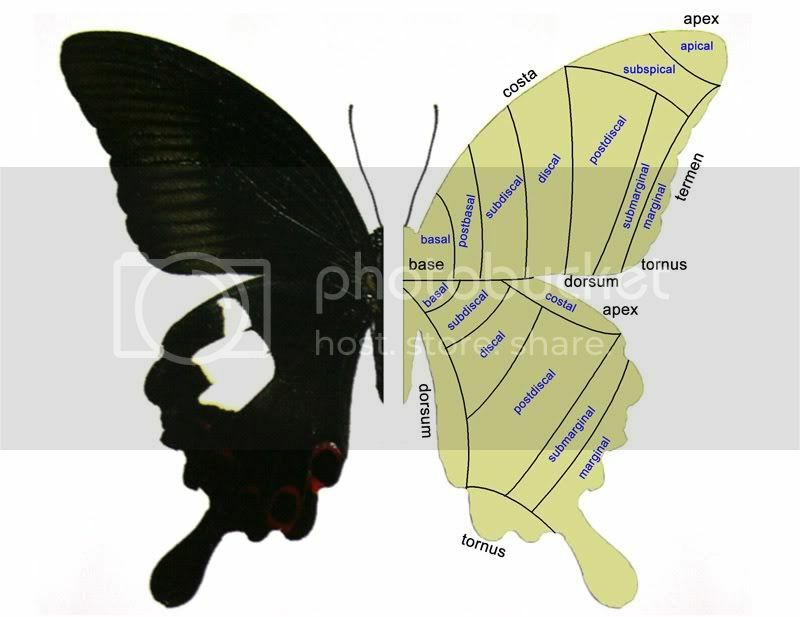 Very good and clear illustrations of the parts of the butterfly, Gan. From wikipedia. Another good illustration is in Pisuth's book. We need to be familiar with these terms to follow the id keys in ref books. I draw this sometime back, not sure what info to include for the left side thought. Fujis2 wrote: I draw this sometime back, not sure what info to include for the left side thought. Wow! many parts to remember.. thks for sharing.